Advances in cloud technologies, automated deployment and iterative development practices are breaking traditional workflows and governance. Unifying deployment tools across the development, test, and operations can greatly improve quality, speed, and reliability. Combining configuration management tools with tool chains across a continuous delivery pipeline can further improve workflow and provide insights into lifecycle that can uncover potential risks and bottlenecks. IT world is becoming increasingly complex and IT administrators are facing a tidal wave of innovations. The promise of cloud and DevOps is to deliver new services from months to weeks to minutes with ability to scale elastically. CIOs and CDOs need to create a framework to help their team start and build sustainable DevOps teams and processes. 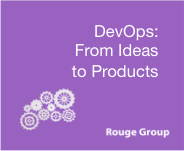 Rouge Group can help your company move from organizational silo to practice and embrace a more collaborative, agile and transparent working working environment.